Warm muffins just out of the oven. The sour-sweet kick-in-the-mouth taste of rhubarb this time of year, sliding through each tender bite. Soft as sighs. I’ve been thinking about making these muffins since I saw the rhubarb plants in our backyard nudge themselves above the dirt. A few weeks ago, those plants exploded with growth. Time to play. I knew what I wanted, and I didn’t mind baking, tasting, and tweaking until these muffins were it. Now you can have some too. There’s something wonderful about rhubarb. I love its tanginess, its celery-like stalk, its girth when fully grown. The leaves are enormous. Did you know that? Even the thickest longest stalk is dwarfed by the palm-frond-sized leaves. (Maybe the slugs stay away from that shade. Whatever the reason, I’m glad at least the rhubarb was safe this rainy season.) It’s an umbrella plant, spreading outward, the ruby stalks hiding. Straight, it has a tang that makes you close your eyes against it for a moment. Stewed or simmered, rhubarb softens into something sweeter, ephemeral and pleasant. After a lifetime of not eating rhubarb, I look forward to its appearance in the farmers’ market. It’s the first real fruit of spring around here. Rhubarb and vanilla are fast friends. So one day, after we cut down as many stalks as we could, Danny and I diced the rhubarb, sliced open a vanilla bean, slithered out the insides, and let them mingle. This, I thought, will make an amazing muffin. They look good, right? I mean, they were good. They were soft and yielding and slightly sweetened. But the streusel topping for which I had high hopes (rhubarb streusel muffins, I told people, and some of them swooned at the sound of it) ended up dominating these muffins. The warm oats and brown sugar had a soft, clumpy texture. Next time I make a coffee cake, I know the topping to use. But these rhubarb muffins? The struesel topping stifled the rhubarb. After waiting all year for that fruit, I wanted to taste it. Back to the countertop for more baking. 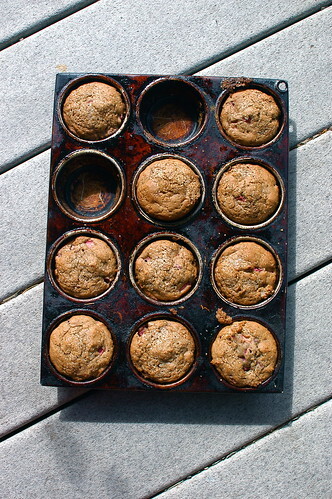 I was inspired to try these whole-grain muffins by this wonderful book, Good to the Grain: Baking with Whole-Grain Flours . After reading raves by Heidi and Deb, plus Luisa’s beautiful post about editing the book, I was convinced to order it. Never mind that every single recipe in the book contains gluten. That doesn’t faze me anymore. In fact, I really only consult baking books that use gluten. It’s baking that compels me, the ratios and techniques, the way butter and sugar and vanilla blend with each other to become something different. Besides, how many baking books have chapters on amaranth, buckwheat, corn, oat, quinoa, and teff flours? Even if the recipes Kim Boyce so lovingly put together with those gluten-free flours use traditional all-purpose flour as well, I knew I could adapt them. If you have been baking gluten-free, this has to sound familiar. In fact, it felt so familiar to me that I felt elated. Aha! It’s not just those of us who have to bake without gluten who have to play and tweak and wonder what to do next. It’s any of us who want to bake with anything other than all-purpose flour. Exactly! That’s the joy for me of baking now. I throw a little teff, a little oat, some superfine brown rice flour together, and then see what happens when I combine them with starches. Honestly, at this point, the idea of baking with just all-purpose flour is pretty boring. Even better, gluten-free baking with whole grains can be healthier than traditional baking. I’m never going to stop baking. Baking with almond flour and amaranth, sorghum and quinoa makes me feel much better about the daily baking we do around here, just as it does for Kim Boyce. Her recipes are not made entirely with whole grain flours. As she wrote, use only whole grains and you have leaden muffins and sunken-ship scones. Mix the whole grains with some all-purpose flour and you have something great. Here is some all-purpose flour, gluten-free. For years now, people have been writing to us, asking if we had an all-purpose flour mix we liked. We did, and we didn’t. We’ve been throwing together flours and storing the mixes in giant Cambros like this since Danny and I met. But I haven’t published one here because I am wary of “THE all-purpose mix.” You probably know what I mean. Most gluten-free books contain a particular mix, an assemblage of flours in a specific proportion. All the recipes in the book require that mix. I’ve tried them, used them, and liked them. I have liked almost all the all-purpose mixes I have baked with in our kitchen (well, except the ones with any bean flours. I just can’t take the bean flours). If they all work sort of well, what were we to do? How could I recommend THE all-purpose mix? It wasn’t until I started baking by weight that it all came together for us. As Kim Boyce writes about in her book, we need whole grains and lighter flours both. For us gluten-free folks, we need brown rice and potato starch, sorghum and tapioca. After lots of fiddling, Danny and I have realized that, in our kitchen, what works best is a 40% whole grains/60% starches mix. If you look at this combination, the brown rice flour and sorghum flour make up 40% of the mix by weight. The sweet rice flour, tapioca flour, potato starch, and cornstarch make up 60% of the mix by weight. Here’s the important part: if you keep to this same ratio of whole grain to starches, you can use other flours you like more for your all-purpose mix. Use millet instead of the sorghum, or amaranth. If you can’t eat corn, use more potato starch in place of the cornstarch. Stick to this ratio and mix up a big batch of flour. You’ll have all-purpose flour again. You can bake almost any one of your old baking favorites now, substituting this mix for the all-purpose flour in the recipe. It’s easy. The only thing you have to remember is this: do not simply measure a cup of the gf all-purpose flour and expect the recipe to work. When you substitute your gluten-free all-purpose flour in a gluten recipe, use 140 grams or 5 ounces for every 1 cup of gluten all-purpose flour. 140 grams or 5 ounces. These measurements are your friends. Once Danny and I decided on this all-purpose flour, the rhubarb muffins fell into place as well. I’d made a second batch, with a bit of batter in the tin, a layer of rhubarb compote in the middle, and more batter on the top. They came out….good. Still not rhubarb-y enough. Danny’s brother Pat was staying with us when I baked these. He liked them. He thought they were done. However, when I made the last batch, and Pat tried one, he said, “Oh, now I get it.” These were spiked through with rhubarb. Just as I have learned to combine both all-purpose flour and whole grain flours, I used both rhubarb compote and raw rhubarb, which softened in the heat of the oven. As much as I loved these final rhubarb muffins, I have to tell you this: the adventure of figuring out the flours and techniques tasted even better. This final recipe for rhubarb muffins is so entirely different than Kim Boyce’s ginger-peach muffins that I can say it is entirely mine. I really like the whole-grain taste and softness that the teff lends to these muffins. These don’t taste like white-flour muffins at all. 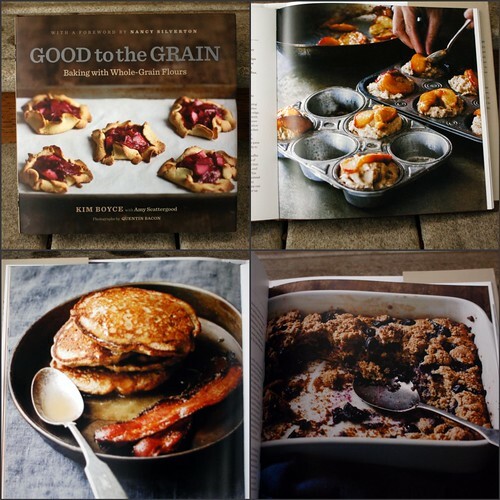 However, Kim Boyce’s book inspired me, with her whole grain and AP flour combination and her baking techniques. So thank you, Kim. The secret to this rhubarb muffin is the double use of rhubarb. You’ll need a good, tangy rhubarb compote  we love Dana Cree’s recipe or the one I wrote about two years ago  and a cup of raw rhubarb. Believe me, rhubarb has such a specific vegetal sweetness that you want the taste to shine through. Here’s a good secret, too. Once you feel comfortable with this muffin recipe, you can make it all summer long with whatever fruit is in the farmers’ market. I made strawberry muffins the other day, after throwing together a quick strawberry compote and slicing up some small sweet strawberries. Danny loved them. Lu ate three of them in one day. We’re going to be making fresh raspberry muffins, blackberry muffins, peach muffins, huckleberry muffins…. Mornings will be sweet around here this summer. Combining the dry ingredients. Combine the AP flour and teff flour. Sift them together into a large bowl. 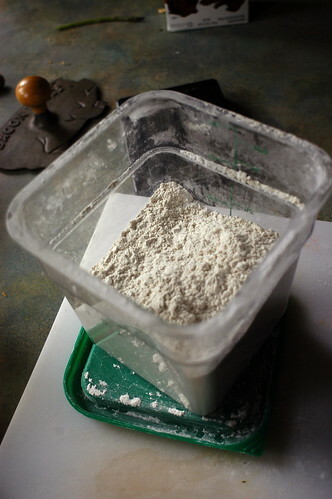 Add the baking powder, baking soda, kosher salt, and guar gum. Set aside. Combining the wet ingredients. Stir together the butter, sugar, and brown sugar. (We did this in a stand mixer, but you can easily do this by hand.) Add 1 egg at a time, stirring well between each egg. Plop in the sour cream and compote. Combine until they are mixed well. Finishing the muffins. Add the wet ingredients to the bowl of flours and stir until they are just combined. Stir in the raw rhubarb. Scoop the muffin batter into the tins, slightly above the edge. Sprinkle raw sugar on top. Baking the muffins. Slide the muffin tin into the oven and bake for 12 minutes, then turn the muffin tin 180° to promote even baking. Bake until the tops are golden brown and the muffins feel firm to the touch, about another 10 to 12 minutes. Take them out of the oven. Let the muffins cool for a moment or two, until you can touch them. Take each muffin out of the tin and turn it on its side in the cup to cool. (Thanks to Kim Boyce for this suggestion. This keeps the muffins from growing soggy.) Eat. These muffins are best when you eat them the day you make them, but they work the next day too. Great tip on the grain versus starch ratio. Here in the UK the range of flours easily (and relatively cheaply) available isn't as wide as in the US. I use potato, corn and tapioca, quinoa, brown rice, white rice, gram (besan), and soya flours, so I always have to giggle your recipes to try and make the right substitutions! Do you have a specific kitchen scale that you like? I've been reading reviews and there are a lot of opinions out there. I'd love to have yours! Have you ever read Patricia Polacco's children's book My Rotten Red-Headed Older Brother? I love the part about rhubarb. Lu might like it too! Wow, gluten-free baking is totally fascinating to me. I am not gluten-intolerant (is that the PC phrase? heh . . . ) myself, but it is nice to know how to bake for those that are! I always learn something new when i read your baking posts, Shauna. Thank you for sharing what you've learned! These rhubarb muffins look like a real delight!! They are looking fabulous even! Thank you for posting a recipe to make your own GF all-purpose flour. I've been using one already, and while I like the flavor, sometimes the chickpea flour is overpowering. And I'm totally jealous of your homegrown rhubarb. I need to trade this big city for a place with land where I can really grow stuff. This is fate; I was just trying to figure out how to email you and beg for a general flour mixture! I really appreciate this, as I am not an adventurous baker. Shauna, will you start to weigh your sugars? These look beautiful! I had dinner with Kim Boyce in Portland recently. She is such a lovely person, and her cookbook is beautiful. So glad you're highlighting her here! Thank you for posting this about flours and baking, and especially about converting recipes. I really apprieciate it! By the way all the photographs look wonderful! Thanks for the all-purpose flour recipe!! I'm intrigued – do you need xanthan gum at all to use this mixture? Other all-purpose mixes seem to include it…and I haven't quite figured out when it's needed and when it's not. Thanks! I'm looking forward to trying this rhubarb recipe, it may be one of today's projects! I agreee with you about the scales…they really are an essential part of gluten-free cooking. Thank you for all your sharing. What about a rice flour-free option? I am sensitive to rice as well. i've always been a little hesitant to get into baking. i thought it was a personality thing – like, i am a free spirit who doesn't follow step-by-step directions very well, so that must mean i am a cook not a baker. but as you have been shifting your focus to baking, i have been so inspired and have begun to create delightful baked goods for my friends and my home. thanks shauna!!! Planted some rhubarb last year and just could hardly wait until spring arrived! I've been playing around w/a rhubarb cake recipe and by the 3rd cake this afternoon, decided that the streusel topping overpowered the rhubarb; cannot tell you how happy I am that you agree – seriously! My baby sis has celiac so am sending her this link – she'll love it! 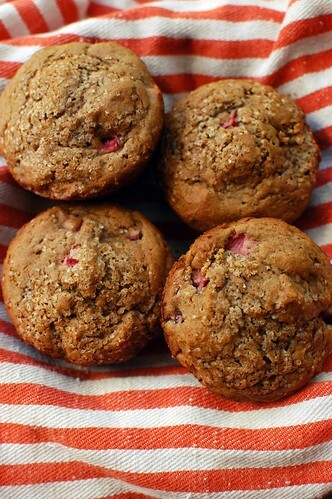 Yummy, yummy rhubarb muffins! I want them now. I will buy a good scale, but I have to search your site to see which one you have. I am helping people to learn how to bake gluten free. They will not measure their floour. Does anyone know how to convert the measurements of the flour mix into cups? Such pretty muffins. I love the rhubarb addition and the fact that the recipe doesn't call for xanathan gum. What a coincidence. I just bought Kim's book 2 weeks ago and read it cover to cover – so excited was I to get into the recipes but then got frustrated trying to figure out how to make them gluten-free. So, perfect timing on getting your gf all-purpose flour combination. Guess I'll be doing a little baking this weekend! Tks so much. You rock! I made the Rustic Rhubarb Tarts from this book, (the picture is on the book's cover), well I don't really have the book but I followed Deb's- SmittenKitchen instructions and it came out AMAZING! The recipe calls for corn flour, cornmeal and AP flour, I subbed the AP flour for 1/4 sweet rice flour, 1/4 tapioca flour 1/4 pot starch 1/4 sorghum flour and 1/2 tsp xantham gum. This was probably the best GF baked good I ever had! I think this is my new to-go-to pie crust! 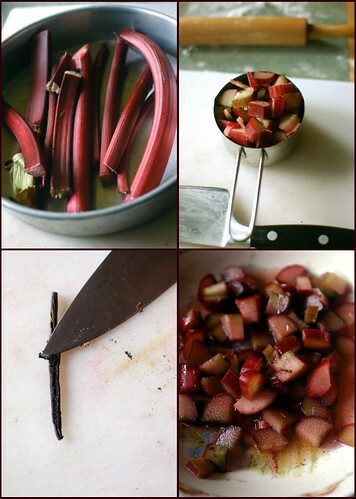 I fell in love with rhubarb this spring, my obsession was borne mostly out of sheer willpower. I am on a mission to eat all the foods I wouldn't eat before, often because of some stupid "food rule" or insolent brat of a teenager rule. After a lifetime of feeling just on the cusp of serious sickness or one step behind wellness I'm finally better and I won't let anything hold me back. I'm excited by your all-purpose flour mix. I mean, really really excited because I am still largely experimenting with gluten free baking and when it works, oh it works. When it doesn't? It's bad, it's discouraging and sad. So, thank you. Really. 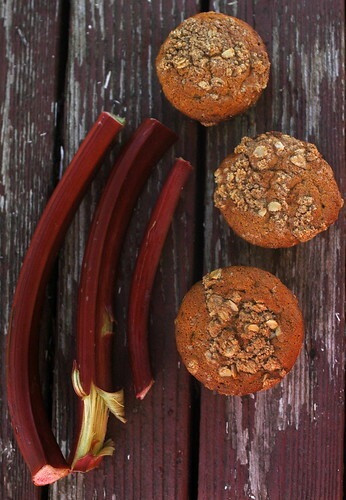 I get my first CSA share delivery on Monday and I am hoping I get some rhubarb to make these muffins. If not, I certainly will have to track some down to make these muffins. I can't stop baking either and I hope to incorporate more healthy grains as I go. Thanks for the recipe. Any ideas about what substitutions you might make for the yogurt if you can't eat dairy??? Shauna, I'm a not a baker, but you give me hope. I always fall back on Pamela's and I love it, but I've noticed the more research I'm doing that those who bake like you do work from the individual flours. I'm slowly but surely building my collection but I'm scared to try my own experiments. The biggest one for me right now is that on top of dealing with the gluten and dairy, I also have sensitivity to night shades. This means that anything with potato starch in it I shouldn't be eating. What should substitute for the potato in a mix like this? And would that thing (if there is one) be something I could substitute into more recipes easily? Shauna, thank you so much for this recipe. It was my first attempt at gluten free and they turned out amazingly!! I now have a stock of AP Gluten Free Flour to use. Thank you for sharing all your research. I'm with you when it comes to using gluten-containing recipes! I almost never use gluten-free versions of recipes – there are so many ones out there that just call for a specific brand of store-bought mix. Also, I can't have eggs and I often find that gluten-free recipes take the exact original recipe and just add an egg to make up for binding power of the gluten. I am still learning how to use all the different flours for different purposes, but its a lot of fun! I'm about 2/3 through your book, and I love all the recipes and advice. I think, however, the best part for me is reading about your experiences and thinking "hmm.. That happened to me too, I can't believe THAT was gluten too.." thanks for putting into words all that we feel. I started up my own food blog last week, Plate Full of Love, and just referenced your book in today's post about quinoa. First of all thanks for the all purpose flour blend. I've been purchasing one, but it doesn't have the "heartier" kinds of flour for my taste. I'm excited to try yours. Hi Shauna!Im Maria, an italian girl who is a big disaster in the kitchen,Im trying to redeem myself from this status and I want to tell you that I learn a lot from your blog, thank you for sharing your talent with us(and sorry for the bad english!)! Whole grain methods are exactly how I've been handling most GF baking. So nice to know I'm on a parallel course with you! Thanks for the cookbook recommendation, and the lovely, bright muffins that almost leap off the screen they're so fresh! I just tried your GF all-purpose flour in a BABYCAKE recipe, by replacing the Bob's Red Mill all purpose flour called for with your flour (and using your ratio of 140g per cup of flour in the recipe) and it worked! So what I've got in front of me is an egg-free, bean-free, wheat-free and sugar-free (sweetened w/agave nectar) delicious banana bread, and that is the most exciting thing EVER for someone who's been found to be allergic to all of the above. I haven't had anything like it in months. ps. note to anyone who attemps to do the same, I cooked the breads for more than twice as long as the recipe called for. I find that her baking time are never long enough. Hundreds of cookbooks pass through my doors from the library each year but good to the grain was one I had to own!! It is so inspiring and the strawberry scones are my new favorite. I love how the sharing of being inspired inspires others, the ripple effect. Thank you for inspiring me this from-the-coffee-cup Monday Morning. I have linked and commented about this on my site, if that is ok, and hope to share your efforts with others! Rhubarbie, rhubarbie, how I love to eat thee! Thanks so much for this recipe and all those links to more sweet-tart delights! Dana's compote rocks. I plan on making Lara Feroni's diabolical rhubarb curd and Rhubars (!) next and then the roasted rhubarb-vanilla ice cream Tom of Tall Clover Farm created. So happy! For years I've been making all my rhubarb into pies, crisp, baked sauces and this fabulous old-time marmalade with ground carrots from Putting Food By. Can you say: repertoire expansion? Do y'all like the ones with the plastic container built in, or the ones with the flat tops where you use your own bowl? I'm getting ready to buy one off amazon (gift card to use…) and there are so many choices. Thanks! Love the blog and all your posts! I'ma new fan! So I finally made the muffins and they are good. I have to admit I didn't use your flour mix because I couldn't get hold of all the flours and I have a load of Dove's gluten free all purpose mix that needs to be used up. So for anyone reading from the UK – Dove's works. I also used Xanthum gum rather than guar gum (also form DOve's). I didn;t have the time to bake when I got the rhubarb from a local market so I chopped it up and froze it. Hint – make sure it chop it as small as you need it as it's impossible to cut once frozen. Also make sure you break up all the pieces after taking it out of the freezer and before you add it to the mix otherwise you get lumps – which I did. Looking forward to making them from other fruits! What is a cup measurement in grams? I'm from Australia and just want to make sure I'm substituting the 140g to the correct cup/gram measurement. These muffins look delicious. I definitely have to try making these! Awesome job! My fave muffins would have to be these Spice Muffins with Maple Cinnamon Frosting. Thanks for sharing! is there a specific reason why you chose to NOT include the guar gum IN the mix? IF I don't include that in the mix, how much do I use in a recipe when a mixture that does have it is used?? Thanks for the help! Can anyone tell me what is teff flour, used for the muffins? These look so delicious and rhubarb is actually in season right now! In Florida, anyway 🙂 I’m yearning to make these, but I’m curious about the teff flour. I don’t have any on hand and wondered if I could substitute something else? Thanks so much! And thank you for your lovely site. My daughter is gluten intolerant and I can’t tell you what a source of help and inspiration and positivity your site has been! So i was wondering… these all look incredible but…. do you make things without sugar?? In our family we are GF, dairy free and sugar free. That being said we found some great Sheep cheese that replaces dairy from cows wonderfully. The thing is its so hard to change recipes with “sugar” in them to honey, agave, or maple syrup. Any suggestions or recipes? We use sucanat and coconut sugar a lot. Will those work for you? Both are a 1 to 1 replacement. If you are looking for a blog without sugar, try Amy Green’s Gluten-Free Sugar-Free. Can I just say that as I am sitting there reading your instructions on the all-purpose flour, I thought, “I just love you?” You explain things exactly the way I think and make it so easy to understand. I read your latest book and can’t get enough of all things Shauna, Danny and Lu! Anyways, thanks for all your help and for figuring this stuff out first so the rest of us don’t have too. If I had to do all the trials myself, I’d never have time, being a homeschooling mama of 4! So I really, really appreciate what you are doing! After spending about $75 on flours and starches, I thought…oh god…these better be good. And they were amazing! Moist, dense, flavorful. Honestly, better than any muffin I’ve eaten from a bakery in a long time. Thank you for taking the time to make your own flour mix and to share it with all us novices. On to the pie crust! thank you, thank you, thank you for this post. i am fairly new to the gluten free arena (diagnosed intolerance 4 months ago) and had completely lost my passion for baking because i was too overwhelmed by the flour struggles. not to mention the crazy expensive gums that i didn’t care for are in nearly every recipe. the recipe for AP flour you have listed here was awesomely successful for me, especially since you included the weights and proportions. definitely will share this site with my friends living the gf life. thanks again! In making these now, after your new flour mixture from 2011, would you use that combo without the guar gum or would you use this mixture and use the guar gum? I’m not gluten intolerant, nor have I ever been a big fan of crackers. I do come from a large Italian family that has always loved to share our favorite/specialty recipes or garden delights. To be able to make these for the 3 gluten int’s in the family was truly amazing and a fun way to show my love, especially to my wife’s sister who only last year realized she’d never eat her beloved cheezits again! So in short, I, and members of my family, thank you very much!